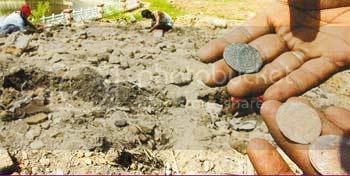 16 July 2007 (New Straits Times) – It’s not surprising that one would be able to find plenty of old coins along the silted banks of the Melaka river. In its heydey as the seat of the Melaka Sultanate and under later Portuguese and Dutch colonisation, the river would have seen many vessels pass through. It’s a shame, however, that the coins seem to have been sold on to collectors rather than to have someone actually come and study them. They are four men, growing RM500 richer by the day from the things they sell. Things they have neither bought nor made, but scavenged. They call themselves treasure hunters. The real McCoy. And the treasures they seek are real enough: Old coins, bits and pieces of porcelain and other antiquities from the era of the Malacca sultanate as well as the Portuguese, Dutch and British colonial period. Their raiding ground is a spot on the river bank of the Sungai Melaka near Jalan Kilang where a 30m-high pile of river dirt has accumulated, courtesy of the contractors beautifying the river. Unlike the archaeologists and tomb raiders shown on TV, the four men, led by Raffiee Mohd Najeer, 37, are armed only with ladles and their method is drama-free. For the past few days, Raffiee and his friends have been climbing the mound of dirt to comb for treasure. “Rain or shine, we are here. We saw the pile of sedimentation and decided to try our luck. We did not expect to hit jackpot,” said Raffiee. “The first coin we found was from the sultanate era. The coin was well-preserved; the writings on it still visible. We sold it to an unknown collector. Read more about the finds from the Melaka river.